The new and improved Cuisinart Prep Plus 11-Cup Food Processor has been keeping steady on top of the best-sellers' lists for quite a while. Is this because it's a quality product, or because there are a lot of places to find it on sale now... or both? It's not often you come across an appliance that has a good balance between multiple functions and user-friendliness, but the Prep Plus has it. 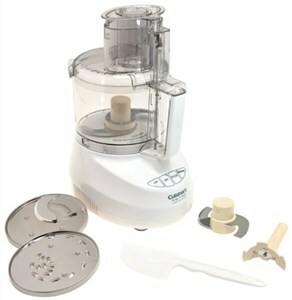 The feed tube, for example, has been updated from previous Cuisinart food processor models to make it easier to assemble and use. It's a wide feed tube at 4.25 x 2.75 inches -- and if that's too big for some of your kitchen chores, a narrower feed tube is located insides the pusher. And if even that's not enough, a small pin-sized hole is located on the bottom of the pusher, just wide enough to accommodate an oil drip for when you're making homemade mayonnaise. The bowl itself is made from a material called Lexan, shatter-proof and dishwasher safe, which is housed in a classic white base. It holds 11 cups and works with a 600-watt motor -- capable enough to handle medium-strength tasks but not something in an "industrial strength" category that you could use for hours on end. But the cool thing here is that the option for kneading dough is automatically sensitive to density. When kneading dough with the Prep Plus, the processor will adjust the speed all on its own -- not overworking the dough, saving mechanical strength. Win-win. One other thing I really like about this set is the interchangeable blades. It comes with a slicing, shredding, and dough blade. Other interchangeable blades from previous Cuisinart food processors should work on this machine as well as 11-cup blades from completely different manufacturers, too. Stainless steel processor blades are awesome and rarely need replacing, but it's always nice to have back-ups. This set also comes with a spatula, a recipe booklet, and an instructional how-to DVD for setting up the machine and making a lot of the recipes shown inside the booklet. There isn't a lot of negative feedback from this set exclusively. A small pet peeve for me is that the center wall which covers the rotation mechanism can be a bit short depending on what I'm trying to make, but over time, I've learned to deal with it and make smaller batches. Ideally, by now the defective units have been alerted to proper authorities so that you don't have to mess with insanely difficult packaging. It'll be tight, no doubt, but that's a good thing... as long as it's removable. Thousands of Cuisinart food processor owners stand by their brand and don't even consider switching. You will likely join their throngs -- just as long as you're prepared that you probably won't be using it within five minutes of it arriving at your doorstep. Keep scissors and an X-Acto knife close by, and you'll be fine. Wanna see this model in brushed chrome or electric red?